Soups are an excellent meal option for those who are watching their weight. Whether eaten alone or as an appetizer, soups, including chowders, stews and chili, offer few calories and a profusion of nutrition in a bowl. They are satisfying, balanced and can be made with an array of ingredients. Although homemade stock is very healthful, it is also time-consuming to make. There are several varieties of prepared broths available at the supermarket. Beef, vegetable and chicken are popular choices. If you are sensitive to salt, choose reduced-sodium broths. For creamy soups, pureed vegetables such as potatoes and winter squashes can be used. Adding cornstarch will also produce a thicker base than broth. 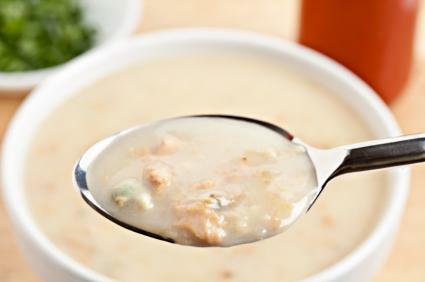 The traditional cream used in chowders can be replaced with evaporated skim milk for a low-fat alternative. By choosing foods from all the food groups, you can make a healthy, balanced soup as a meal in itself. Protein is often skinless poultry, tofu chunks, beans, fish or pork. Vegetables of all kinds can be used to add fiber, vitamins and minerals. Beans, such as kidney, lentil and navy, will also add fiber and nutrients. Whole grain pasta, brown rice and barley supply complex carbohydrates in many soup recipes. In medium saucepan, combine potatoes, celery, onion, margarine and water; bring to a boil. Reduce heat and cover; simmer until potatoes are soft, about 15 minutes. In medium bowl, mix milk, evaporated milk and flour until smooth. Add milk mixture, clams, clam juice, thyme and pepper to saucepan. Stir constantly and cook until thickened, about 10 minutes. Serve and add bacon crumbles to each bowl. In medium saucepan, heat oil. Add onion and garlic; sauté about 5 minutes until tender. Add broth, lentils and water; bring to boil. Reduce heat and cover; simmer until lentils are soft, about 45 minutes. Add Swiss chard leaves, cilantro, cumin, salt and pepper. Stir well and cook until chard wilts, about 5 minutes. Stir in lemon juice. Serve. Makes 4 servings.196 Calories, 4 g Fat, 1 g Saturated Fat, 14 g Fiber, 28 g Carbohydrate, 14 g Protein, 0 mg Cholesterol, 225 mg Sodium. Soup can be added to just about any diet. 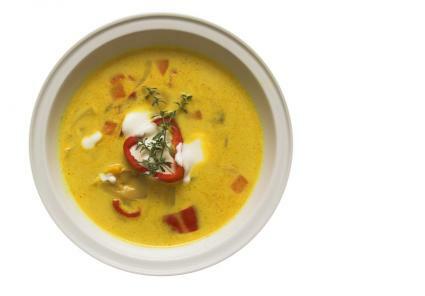 A well-chosen and healthily prepared soup can fill you up without adding too many calories. Even better, soup is tasty and easy to cook.